KATHMANDU: Marriott Kathmandu hotel has proudly announced the vacancy for Associate Director Sales, Sales Manager, Sales Executive, and manager, Executives, Finance Manager, Event Manager and Outlet Manager. The applicants are supped to have minimum qualification on diploma in Hotel Management or equivalent. The applicant’s applying for the post should have minimum 3 years of experience in any international hotel chains with at least 1 year of experience in the given position. The candidate should have Nepali Nationality and Candidates with experience in various countries with diverse cultures and background is an advantage. 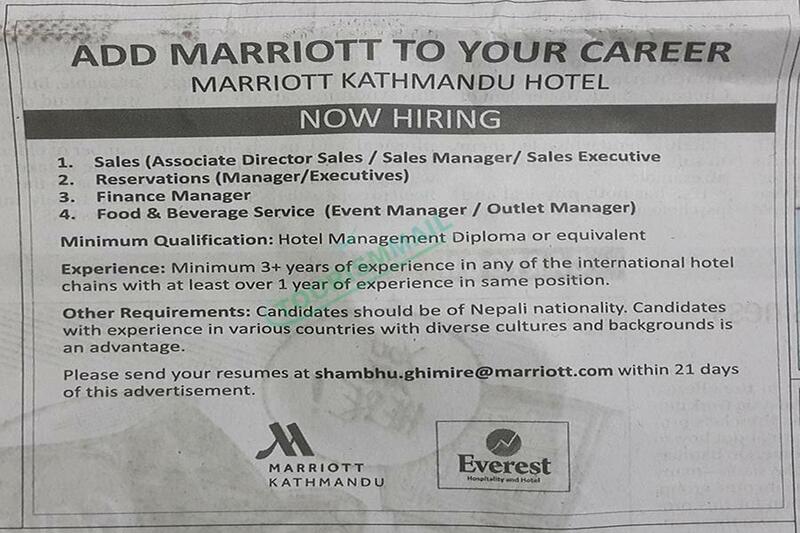 The applications should be submitted in shambhu.ghimire@mariott.com within 21 days.